Staci and I were victims. Victims of something terrible. An earthquake, a fire, a bomb, the apocalypse. The meeting room was in shambles, tables overturned, chairs strewn about, and moaning employees trapped in the dark. Well, we were supposed to act like we were trapped and really moan like the end of the world was near. We even had makeup done. 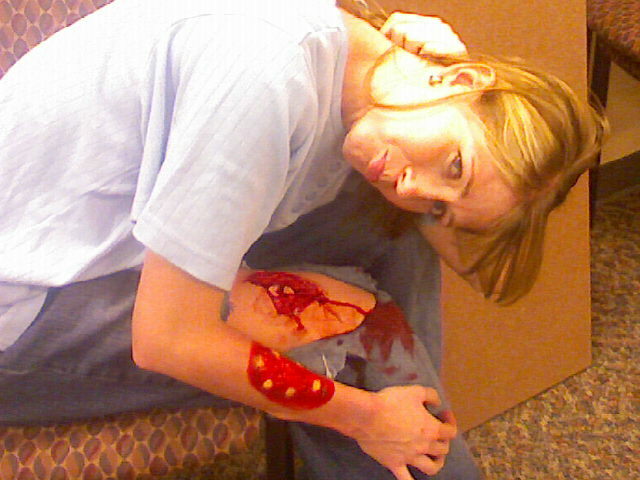 Clearly, you can see that my injuries looked legit: a burned forearm and a broken femur. The femur was the injury that usually killed me. At the time, I had been with my company for about two years and was in my second position. Staci and I were working on the same project together, which felt like glorified data entry, aliasing assays in a code set. Because that makes sense to you. And because you are impressed with our skills to accomplish this task! We took a break from the grueling project to take part in onsite CERT training. The company always had a team of CERT folks around, in case of emergency. Those who passed received coveted hard hats and fluorescent vests. How did I die? The time my broken leg was straightened out before being secured for my journey to the other meeting room. The time I survived? A trainee tied my leg up, in a bent position, to the overturned chair I was trapped on, and I was carried to the safe zone with the chair. The best part? Getting paid to do something other than work tasks for an hour. And those were not MY ripped pants. I didn’t sacrifice my own wardrobe for the cause. Episode 36: What would YOU do with four walls? Stacky forgot yesterday that she only has three walls here at work. I reminded her of this, but didn’t remind her that those walls are mostly made of fabric and not even as tall as I. They’re still taller cubicle walls than some workplaces, though. So I got to thinking about what life would be like with four walls at work. Stacky helped me with this thinking. We came up with a nice list in our IM conversation of what we would do if we could close the door and get some privacy. None of the list items had to do with working… imagine that. Photoshop pictures of my coworkers – need I say more? What would you do with a little privacy at work? Bring on this week’s fabulous installment of Therapy Thursdays where Larrie gets her much-needed therapy from the Doc (hey… imaginary therapy works, too, and costs less). DOC: You made it; would you like to discuss what everybody else is discussing? DOC: Yaknow, all of my patients. LRE: Unless you’re scheduling therapy sessions with all my other personalities without telling the main me, you don’t have any other patients. DOC: Well, if I did, they’d all be living in fear because of the economy. LRE: Oo, no, let’s not talk about that. There’s too MUCH to say. DOC: So you think this blog would be too long if we went down that path of discussion? LRE: More like a path of destruction and definitely, yes, it would be too long. Here’s a great link for the best economic blog, in my not-so-humble opinion. We’ll leave it at that. DOC: Gotcha… one of those underlined things. Okay, then let’s talk about something else F-U-N.
LRE: Oh yeah? What have ya got in mind there, Doc? DOC: I did some research… well, basically I clicked on one of those blue underlined things from MSN’s homepage and came across some interesting little facts about love. DOC: Yes, should make for an interesting conversation. LRE: All conversations in my head are interesting. Okay then, Doc—bring it. LRE: Oh that’s a very true statement. DOC: Oh yeah? Got something juicy to share from work? LRE: Not exactly, but the statement about proximity, I think, is very true. DOC: Well, duh, that’s a given. LRE: Yeah, apparently, even some guy living in Phoenix is too far away for much of a relationship. DOC: Plus, who would want to live in Phoenix? DOC: So no office romances? LRE: Not that I’m going to tell my imaginary doctor, but Stacky and I do have a good time discussing romances in general and coming up with nicknames for the lucky men who take me out. LRE: Yeah, there’s some good ones, but it’s hard to keep track. DOC: Ha, I bet… stop being so facetious and share a nickname or two already. DOC: Oh yeah, that is a good one. LRE: Yep. And then there’s odd ones which really make fun of our nerdiness for working where we work. DOC: Huh? Didn’t follow that one. LRE: Well, see, that guy in Phoenix area, we called him Milk Protein. DOC: Yeah, I definitely don’t follow. LRE: It’s because we have a test here for an allergen to the protein in dairy products… called casein. Anyway, Phoenix’s name was similar to that so we, of course, called him Milk Protein. DOC: And did he have a milk moustache and did he turn his head to the right when you kissed? LRE: Of course, there are plenty, but two is good enough for now. DOC: Oh, come on, please? LRE: You’re begging? Fine, I’ll just throw out a few more: SU (for stood up), UFSteve, and TBBF (for to-be boyfriend). There ya go. Anything else from your FASCINATING MSN article? DOC: Thank you for sharing and yes… here’s one. Says that 11% of women have researched a guy online. Have you? LRE: But of course. I’m surprised that number is so low. DOC: So anything interesting from that research? DOC: Oh, thought that would be a good question. Hmm, let’s see if there’s one more good one. DOC: Here’s one… it says that after you get dumped, you love the person even more… for a time. LRE: Oh, okay. That makes sense then. LRE: Well, I was thinking about how quickly I got over one certain relationship a wee bit ago. LRE: Really quick… like one day quick. DOC: So then how does that make sense? LRE: Because it refers to being in a happy union. DOC: Oh, well then… good thing that relationship is over then. DOC: What was his nickname? LRE: Don’t worry about it.